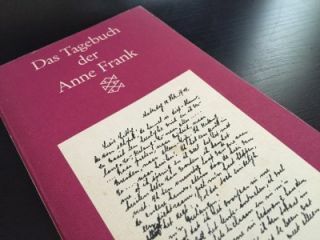 I read the book ” The Diary of Anne Frank” as an eleven year old and was inspired to begin writing my own diary, which I have continued for over 30 years. I am convinced that Anne’s diary was one of the triggers that made me a documenter. I was able to fulfill a lifelong goal to visit the Anne Frank House in Amsterdam this past week. The actual house, Anne and her family hid for over two years from the Nazis is now a museum. the imperative of sharing and connecting to contribute to a global perspectives. The museum allows people to walk into the tiny rooms of the “secret annex” and “feel” the fear always present of being discovered, how to survive, the worries how and when the war will end, family dynamics and interactions. The list goes on. The Anne Frank House is a museum where visitors are given the opportunity to personally envision what happened on this very spot. Anne’s father, Otto Frank, specifically requested that the rooms were to be kept empty to symbolize the void left by all who were taken and never returned. There are pictures in each room ( I believe from 1999) when the rooms were recreated WITH furniture for demonstration purposes only. Sprinkled throughout the museum are quotes from Anne’s diary, video interviews of the survivors and their memories. One wonders, how the survivors were able to cope and continue life after the war. One of the quotes I heard (I believe it was from Otto Frank, Anne’s father), struck me specifically since we were traveling with my children and granddaughter. I could not help myself to make connections of Anne’s determination to write, the diary, the museum and the profound impact her words still have to visitors of the house and readers of the book. I continue to ask myself about the importance of documenting with an audience in mind and the moral imperative to “preserve”(through different media) our lives, thoughts and ideas for future generations to LEARN from. From the Anne Frank Organization we learn that Anne and the other people in hiding thought similarly. On March 28, 1944, the people in hiding hear a special news report on the Dutch sender broadcasting from London, Radio Oranje (Radio Orange). Dutch Cabinet Minister Bolkestein announces that diaries and other important documents will be gathered when the war ends, as a record of what happened to the Dutch people during World War Two and to be preserved for future generations. The people in hiding immediately think of Anne’s diary. When you write in such a profound manner and share your thoughts and innermost feelings, the impact on the world can be robust. What lessons can we learn and what parallels can we draw when thinking of Anne Frank as a writer? The Anne Frank Organization dedicates a section of their website to this question. I wonder, what the world would have lost, if the diary and loose papers would have been lost or Anne’s father would have decided to not publish them? I also often wonder about Anne’s sister Margot. She wrote a diary as well. What happened to it? Was it lost? We know so little of Margot. She was there alongside her sister. Why did she not “survive” in the minds of her readers from around the world. What we learn from her, is only THROUGH Anne. What was her inner voice like? What did she stand for? we all know that history was written by the victors. What about the other side to the story? What about the experiences of the loser’s side? What about the voices of the silent ones, the forgotten ones, the less privileged ones? What is our morale responsibility of sharing our voices and experiences? I think Anne Frank would have become an amazing blogger, if she would have lived to see the age of self-publishing.